* Morfik – Google&apos;s Web OS initiative. * Live – Windows/Office over the web? (That too Microsoft doing it!!!?). * Blummy – Bookmarklets in one place. * Clipmarks – Annotation tool for the web. * Rollyo – Customized searches. * Blinkbits – News, blogs, articles on favorite subjects. * Stumble Upon – Great Firefox extension. * Furl – A good bookmarking tool. 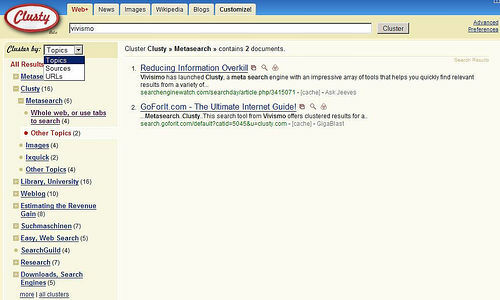 Clusty is a meta search engine. As the name suggests, Clusty clusters the search results. The best part of Clusty is that it is integrated with Wikipedia. So, you can just search for words in this search engine, see what the related categories are. In fact, it is not even necessary to open the pages. The results (especially in Wikipedia) itself give you what you are searching for. If that is not enough, you have customization features, preview etc. There is also a Firefox toolbar for Clusty. 1,286 search plugins for Firefox!!! Are you looking for some search plug-ins for Firefox (the one that goes into the little text box to the top-right)? Then your search should end here. You can easily find the search plug-in of your choice here.